In our next Open Beta update, we’ll be addressing several items that include the AGM-56E for the AV-8B CTD and AIM-9X persistent search tone. The F-15C Aggressors BFM campaign puts you in the cockpit of an F-15C Eagle as a new Aggressor pilot with the 65th Aggressor Squadron at Nellis Air Force Base. Based on real world procedures, you will fly as "Red Air" against "Blue Air" forces. Upon arrival you will fly a familiarization flight around the Nevada Test and Training Range (NTTR). Then you will face a series of challenging Basic Fighter Maneuver (BFM) missions against similar and dis-similar aircraft. Additionally, there are 10 single player practice missions with in-air starts so you can perfect your BFM tactics, techniques and procedures. There are over 1,000 voice-overs and over 45 pages of briefing material including the F-15C Amplified Checklist, RED FLAG Spins, Red Forces In Flight Guide, Maps, Diagrams, Custom Kneeboards and Mission Data cards. An important aspect DCS World War II is the addition of additional player-controlled and AI aircraft. Some of these include the P-47D, Mosquito, A-20, C-47, Fw 190 A-8, and Ju-88. All of these are various stages of development, and they will serve a vital role in fleshing out the DCS World II experience in concert with the new damage modelling, new World War II era maps, and dogfight AI. As each of these elements progress to the point we’re ready to introduce in DCS World, we’ll be talking about them much, much more. 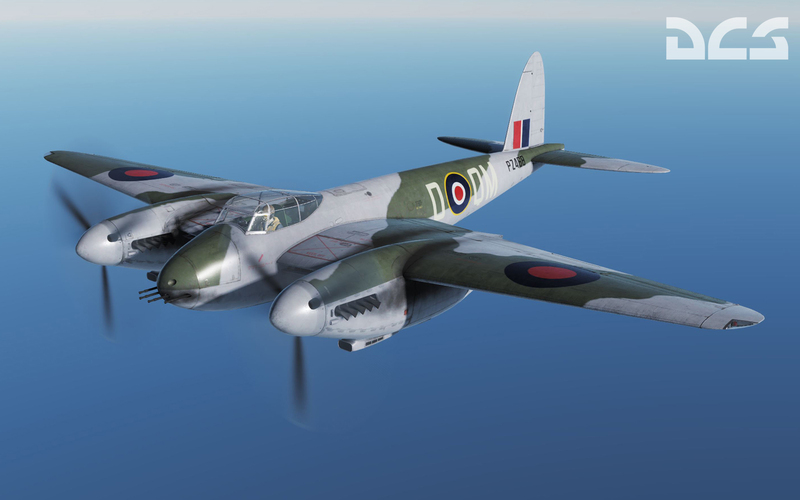 Today we’d like to show off some of the P-47D skins we are working on, as well as the Mosquito.